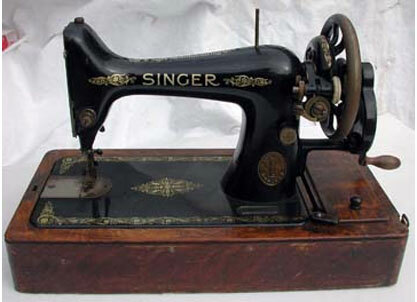 This little Singer is a 3/4 size version of a Model 66. Ours is in pretty rusty condition but the mechanism works fine. Because of their small size and lighter weight, they are much sought after. We have sewed a little on this hand crank and soon learned that it is nice to be able to feed fabric into the machine using both hands. You don't sew fast enough that you can't stop mid-stitch and make corrections to your fabric alignment or placement with both hands then sew again. We also have a bentwood case for this one. However, we don't have the key for the case, so the case is used as a dustcover only. 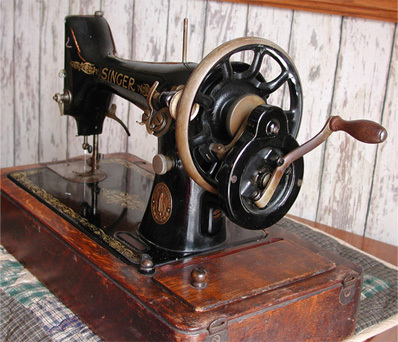 The machine could be used for a treadle or as a hand crank. The base above shows a slit and holes between the storage compartment and base where the treadle belt could be fed through. 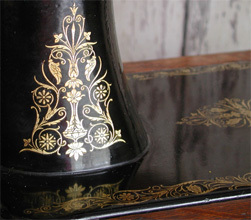 Although we haven't seen one, we speculate that treadle bases were available that this base could be dropped into. The hand wheel is equipped with a pulley and groove for the belt The bolt-on hand crank has a finger that fits between the spokes of the hand wheel. The gearing is such that the hand wheel or balance wheel is turned toward the operator while the hand crank is advanced away from the operator. Definitely designed for a right-hand person. The needle makes three complete stitches with each revolution of the hand crank (Jim counted them!). Our 99 makes very nice stitches. It makes a lockstitch using a rotating hook. The bobbin is easily accessible beneath the left slide. We don't have a manual but apparently were successful in threading the machine judging from the stitches it sewed. It isn't clear how the bobbin winder receives its thread. Jim pulled a loop from the spool toward him and let it slide through his fingers with one hand and played it into the bobbin winder while turning the hand crank with the other hand. The hand wheel has a locking knob which disengages the needle during bobbin winding. Our Singer 99, like many of our older Singers, has an attractive faceplate. 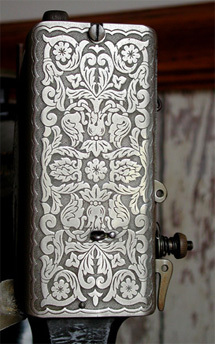 While most exposed metal shows signs of corrosion, the faceplate remains very nice. Metal parts which appear to have received a frequent oiling remained protected the best due to a dried oil coating.We have seen other like units with much better chrome or nickel but we suspect they were later models.This machine must have seen considerable service as thread polished the faceplate on the thread path. The machine has nice decals. However, Jim sadly discovered they come off very easily if you get too aggressive in trying to polish the machine. These decals aren't nearly as resilient as newer ones. 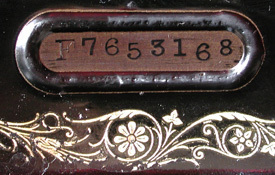 According to Singer's web site, a machine having serial number F7653168 was made during 1917 at Clydebank. Scotland.